Johann Sebastian Bach (31 March (O.S. 21 March) 1685 – 28 July 1750) was a German composer and musician, notably organist and harpsichordist, but also violinist and violist. 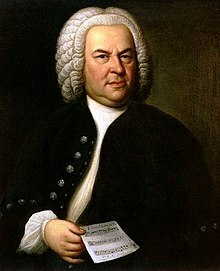 Bach is now generally regarded as one of the main composers of the Baroque period, and his works are now considered to be among the greatest in the Western classical tradition. To the glory of the most high God alone, and that my neighbour may be educated thereby. Und soll wie aller Musik also auch des Generalbasses Finis und Endursache anders nicht als nur zu Gottes Ehre und Recreation des Gemütes sein. Wo dieses nicht in acht genommen wird, ists keine eigentliche Musik, sondern ein Teuflisches Geplerr und Geleier. Bei einer andächtigen Musik ist allezeit Gott mit seiner Gnaden Gegenwart. To be able to hear J. S. Bach take a melody and improvise what amounts to a spontaneous composition is the most amazing thing I can think of. One of the most extraordinary things about history's most extraordinary musician is the fact that this man's music, which exerts such a magnetic attraction for us today, against which we tend to measure much of the achievement in the art of music in the last two centuries, that this music had absolutely no affect on either the musicians or the public of his own day. And the strange thing about Bach is that he doesn't at all fit our conception of the misunderstood genius who was years ahead of his time. He was certainly misunderstood, but not because he was ahead of his time, rather because according the musical disposition of that day, he was generations behind it. The prerequisite of contrapuntal art, more conspicuous in the work of Bach than in that of any other composer, is an ability to conceive a priori of melodic identities which when transposed, inverted, made retrograde, or transformed rhythmically will yet exhibit, in conjunction with the original subject matter, some entirely new but completely harmonious profile. I think that if I were required to spend the rest of my life on a desert island, and to listen to or play the music of any one composer during all that time, that composer would almost certainly be Bach. I really can't think of any other music which is so all-encompassing, which moves me so deeply and so consistently, and which, to use a rather imprecise word, is valuable beyond all of its skill and brilliance for something more meaningful than that – its humanity. Bach is, for me, the touchstone that keeps my playing honest. Keeping the intonation pure in double stops, bringing out the various voices where the phrasing requires it, crossing the strings so that there are not inadvertent accents, presenting the structure in such a way that it's clear to the listener without being pedantic - one can't fake things in Bach, and if one gets all of them to work, the music sings in the most wonderful way. Pongileoni's bowing and the scraping of the anonymous fiddlers had shaken the air in the great hall, had set the glass of the windows looking onto it vibrating: and thus in turn had shaken the air in Lord Edward's apartment on the further side. The shaking air rattled Lord Edward's membrane tympani; the interlocked malleus, incus, and stirrup bones were set in motion so as to agitate the membrane of the oval window and raise an infinitesimal storm in the fluid of the labyrinth. The hairy endings of the auditory nerve shuddered like weeds in a rough sea; a vast number of obscure miracles were performed in the brain, and Lord Edwards ecstatically whispered "Bach!" I would vote for Bach, all of Bach, streamed out into space, over and over again. We would be bragging of course. Lewis Thomas in The Lives of a Cell: Notes of a Biology Watcher, on what message to send to an extraterrestrial civilization. Bach opens a vista to the universe. After experiencing him, people feel there is meaning to life after all. This page was last edited on 23 September 2018, at 15:10.